Rick Orman was a cancer survivor from 2000 until his death in 2007. His wish was that this testimony will provide encouragement, wisdom, direction and hope to all who have been touched by cancer. In Living Through Cancer, Rick Orman brings you along side and relives his personal battle with cancer. He shows how your faith, appropriate medical care and wise lifestyle changes are critical to beating cancer. Among many topics, the book: examines what successfully worked for Rick provides an overview of the role that the patient, family, friends and your healthcare team play in the recovery process includes actual examples of organizations dealing with the needs of patients and their loved ones. 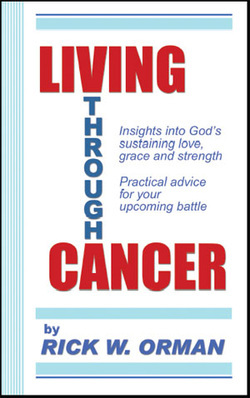 The book also includes twelve appendices that provide helpful information for fighting cancer.